In case your organisation is depending on an Identity and Access Management tool to assign rights to the tools in the toolchain, then it's likely that all of your permissions are handled through Group assignments and not to individuals. Visual Studio Team Services and Team Foundation Server allow rights assignments to groups in almost every possible location and assigning those rights is doable through the TFSSecurity utility. Almost every location... It turns out that assigning a group to be a Team Administrator was not (is not in TFS) possible through the UI. In the past, I've contributed to the TFS Team Tools from the ALM Rangers. That project had since been deprecated, though it still has a few unique features. I've decided to resurrect it and you can now find it on my GitHub account. While I was at it, I incorporated the functionality to list, add and remove Team Administrators. It supports adding individuals as well as groups. You can now download a version of the TFS Team Tools from the GitHub. 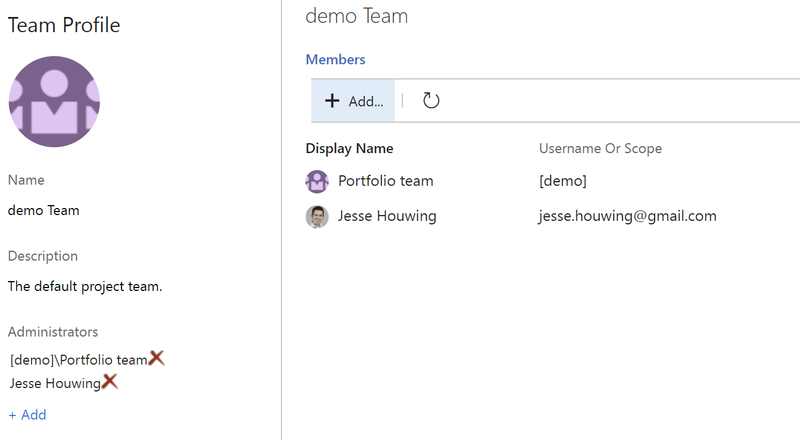 What other features are you looking for when setting up new Team Projects in TFS or VSTS? Any repetitive tasks you'd like to automate? Please leave your comments below or file an issue on github.